A lovely Sunday afternoon spread out before me in early October. I asked myself: read a novel or do some work? On such a day as that Sunday it was a no-brainer, and I set out with my camera in hand, heading out to the old barn. Passing the community garden, I spied Sister Linda Dusek cleaning out a patch of flowers. Great! Linda showed me the expanse of golden nasturtiums still blooming and said they were the favorite flower of Sister Colleen Haggerty’s mother Olive, who recently died at age 99. Linda picked one for me, which I stuck behind my ear and sauntered off. Near the old barn, I head the sound of a power mower and there, coming around the corner, was Sister Margaret Wurm in her sweatshirt, cap and protective earphones, fully in charge of the big power mower. Great! My goal now was to walk to the woods on what we at the monastery affectionately call the Vista View Road. At the beginning of this walk, someone has placed a very large stone. Over time walkers have placed small stones on top of the rock to make a cairn, as if to mark a sacred place. There are two paths, one of gravel and one of grass, set between ancient elm trees. The branches of these trees form an archway that seems to stretch endlessly, luring me to the dark mystery of the woods. Walking the road I could smell the moist earth and hear the distant sound of college students engaged in a game of softball. All sounds of I-94 were blocked out. Glorious! On my right was a large, still-green field filled with golden sunlight. I chose to walk the road by the field on my way back, the sun overhead and a cool breeze on my face. At that moment I found that I was perfectly content and that I had everything in my life that is important. It became abundantly clear that the choice I made to choose neither the novel nor the work was truly an invitation from God. The early monks taught that there were three books that one should read for lectio divina: the book of Scripture, the book of nature and the book of our own experience. This afternoon was a transformative moment of reading nature and breathing in the wisdom and peace that was offered. By the way, the novel was The Help by Kathryn Stockett. It’s a must read! Here at the monastery, October 24th is a big day. This is the anniversary of the consecration of our chapel, a community celebration. These two Cs are what brought Sister Priscilla Schmitbauer to live out her call and build our chapel. Who was S. Priscilla? An elementary school teacher chosen by the prioress in the early 1900s to become the plant manager at the monastery. I doubt if even in her wildest imagining she thought she could or would oversee the building of Sacred Heart Chapel, the heart of our home. Plans for Sacred Heart Chapel go back almost 100 years. The Sisters named three criteria to guide the building—that the Chapel be beautiful; serve both present and future needs; and not exceed $50,000. Because George Stauduhar, the architect, lived in Rock Island, Illinois, and the U.S. mail was the means of communication, we have the complete story of the Chapel’s building. Priscilla not only kept copies of the architect’s letters; she kept copies of her letters to him—an archival treasure! 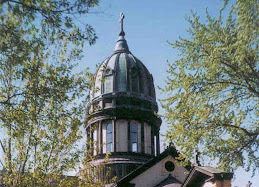 The Sisters wanted a dome on the chapel. The architect balked at that. There was no way to have a dome under the budget laid down. To this edict, S. Priscilla responded almost immediately: “After due deliberation, it has been decided that the Dome should not be omitted.” The Sisters would have their dome! The architect was advised to contact the contractor and come to “an estimate of the lowest probable cost of the Chapel” (letter to Stauduhar, Jan. 22, 1912). The chapel was completed in 1914. Two of the goals had been reached and continue today: the chapel is beautiful and it serves present needs. The total cost for construction and furnishings, however, was $190,000! 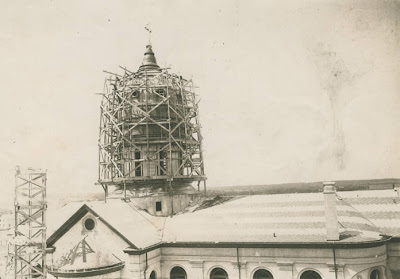 The recorded response of the Sisters to their new chapel—with Dome: “[T]he Chapel stands as a lasting memorial and open manifestation of the living faith that dwells in the hearts of the Sisters” (Community Chronicles, 1914). Psalm 127 says that “unless the Lord builds the house, the builders labor in vain.” We are so grateful for the God who built the “house” through the heart, hands, and determination of Priscilla’s labor! ﻿﻿﻿ The students in Brian Hall residence on the campus at the College of St. Benedict wanted a sister to come to their “Tea Time Thursday” gathering to talk about S. Brian Spain. I was delighted to share with them a bit of what I knew about her. It wasn’t difficult to recognize how she endeared herself to others by embodying humanity, humility and humor. 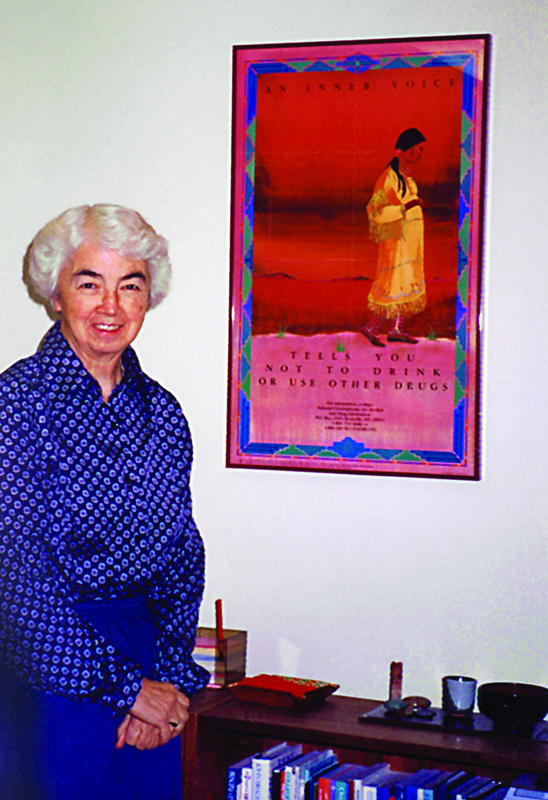 Her Benedictine presence was felt in such varied ways on the college campus during her 28 years. She wholeheartedly gave of herself as: Counselor, Student Development Coordinator, Residence Hall Director and Benedictine values consultant. 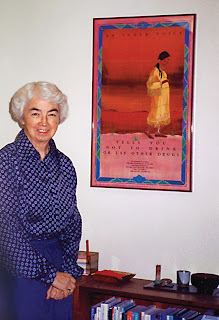 Her sociology major and her admiration for Dorothy Day alerted her to the needs of the poor. Her sense of justice called her to help persons of color in Mississippi to prepare them to vote. And her listening ear and unflagging ability to “challenge and support” students continually spoke of her ability to walk lovingly with humanity. She journeyed with her own humanity in a uniquely humble way. A maple tree was planted outside one of the residence halls to acknowledge her long-time effectiveness with students. A newly constructed residence was named after her. She received an award from the city of St. Joseph for developing policies that strengthened ties between the college and the city. And on all these occasions she acted as though nothing extraordinary was happening. Maybe it was her humility that monastery leaders noticed when she was appointed to work with women who joined the monastery as Formation Director. Or was it her humor that leaders recognized would help her simultaneously look at the growing edges and innate goodness in the women seeking a monastic life style? It certainly was her humor that won the hearts of many who worked and lived with her over the years. A cup of tea is raised in your honor, S. Brian. Others that come later may not know your twinkling eyes. But all of us who felt your presence attest to your giving spirit and raise our cups in solidarity. "How do you celebrate birthdays?" you might ask. Here at Saint Benedict's, because we are a large community – in St. Joseph, MN alone, there are about 150 of us living in or around the monastery - the entire community could not celebrate each sister's birthday. In fact some days there are several birthday sisters. But we have a couple of ways of letting everyone know whose birthday it is on a particular day: our internal newsletter has a list of birthdays for the month and in our dining room there is a special place where a sign is up for the day announcing a birthday . . . or two or three. S. Janet Thielges works on these announcements all year round and succeeds in making them very unique for each sister (see picture). If the sister is in the dining room on the day of her birthday we sing Happy Birthday to her during the meal. She will also be remembered with many birthday cards left on her mail shelf. A simple but genuine sign of our love for her. There are some birthdays that are particularly special. If a sister celebrates her 90th birthday the entire community at St. Benedict's gathers during the afternoon for special treats. For the rest of us, until we reach the venerable age of 90, birthday celebrations can take various forms. If we live in a small group of sisters, e.g. 3, 4, or 5 sisters, our living group might ask the sister whose birthday is approaching how she would like to celebrate . . . movie and a special dinner . . . have a few friends over for a birthday party . . . go on a picnic . . . or go visit a museum, etc. This past Sunday night S. Dolores' living group invited some sisters over for a hors d'oeuvres supper and a birthday cake for her birthday in a few days; it just so happened that it was also Sister Jeannie's birthday so we celebrated her as well. (See picture). In past years several of us who have birthdays in October have gotten together some time during the month for a special dinner. Other times, when a group is either a little larger which means several birthdays during the year, or if in a smaller group 2-3 sisters have their birthday close together the group might decide to ask each sister to choose a "person day" so the celebrations get spread out over the year. We love parties so we do not want to miss out on any. No matter how we celebrate, there is always a special prayer as part of the day or evening; birthdays are occasions of thanksgiving . . . giving thanks for the person's life, the many ways she builds up the community, and the many gifts she shares with us all. At 6:30 a.m. on Wednesday morning, I was on my way to San Juan, Puerto Rico. It was long weekend at St. Ben's and so everyone was "off" for the weekend to enjoy some glorious last few days of summer! Usually, I go on a writer's retreat or stay home for some much needed R & R. This weekend, however, I was going on a site visit to observe our Benedictine Women's Service Corps placements in Humacao with the Benedictine Sisters of Puerto Rico. It was exciting to be flying to the Caribbean. I had been telling everyone who asked what I was doing for the weekend that "I was going to Puerto Rico," and loved turning a few heads. No one expects that I would be going that far for four days of break. That made it all the more exciting! So, when I landed in San Juan, I was eager to see Ashley and Daisy. When I opened the door leading out from baggage claim, intending to run and hug them, I was totally blinded because my glasses fogged up from the humidity. My breathing seemed impossible for a couple of minutes. I had been warned, but even so I was not prepared for such high humidity! It was unbelieveably good to hug both of them and be hugged back. They have been in Puerto Rico for six weeks and were eager to see someone from "home." Puerto Rico is beautiful, of course, with lush greenery and gorgeous hillsides. The beaches, I hear, are grand. Since I was there to visit our young CSB grads, I had no vision of doing "touristy" things. We stopped, however, to eat at a lovely Italian restaurant on the way to Humacao, and later in the week, drove to a lechon grill in the mountains. At one of these famous places known for pig roasted on a spit, we enjoyed a delicious meal by a wayside stream and park. On Saturday, we had the chance to see EL Morro in Old San Juan where the Spanish fort has been standing for hundreds of years, serving as a strategic lookout in times of possible invasions. Even as recently as World War II, it was the place from which German submarines were spotted. So, how are Ashley and Daisy doing? They love it and are having a wonderful time. Ashley is trying her hand at teaching English to kindergartners. She teaches them songs with both words and actions, along with teaching them about letters and numbers. Ashley has three groups of about 20 kindergartners each, and so Daisy helps her with one of the groups. Daisy's main focus, however, is computer lab assistance where she helps all classes with finding their way around the internet, printing, and learning the keyboard. Besides that, Daisy is the computer lab director's assistant. Only with gratefulness and admiration can I look upon what these women are doing. They have taken on a huge challenge by changing their place of residence, changing their "jobs," changing from living in college dorms to a monastery with sisters, and essentially changing their entire style of living. They chose this major challenge in order to give a year of service in a place far away from home and in an entirely different culture. With deep faith and huge hearts, they have been in the process of adjusting to a new life. God has been gentle with them, giving them the strength to meet the challenges straight on and moving forward with great dignity and love. Blessings and prayers to you---Ashley and Daisy--- for the new life you are bringing to the Benedictine Sisters of Humacao. Living on this monastery campus for the past 40 years, I am gratified by how far we have come in learning to appreciate and nurture the soil, the trees, the flowers and the wildlife around us. The campus we share alongside the College of Saint Benedict is beautiful, generally well cared for and much appreciated by those who walk the varied paths all around us. In particular, we have a lovely woods on the south end of the campus that invites us to even more appreciation of nature. PS. (I Can’t resist) Q: Who is the patron saint of e-mail? A: St. Francis of a cc. 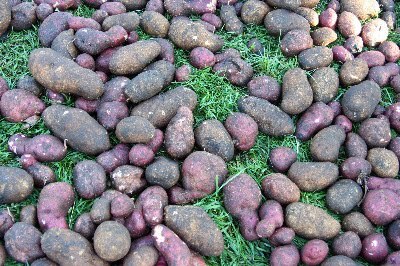 photo: Yesterday's potato harvest from the Sisters' CSA garden, Common Ground Garden. Connecting people to local food producers is one way the Sisters' continue to promote sustainability and a connection to the land. I am on vacation in Washington state visiting family and friends. I have done a lot quilting and connecting with my mom in the mornings over a good cup of coffee. Yes, my mom drinks good, dark Starbucks coffee. The weather has been fabulous with fall colors, mild temperatures and sun! Most mornings in the Pacific Northwest start out overcast and you wait for the movement of the day to reveal its colors. 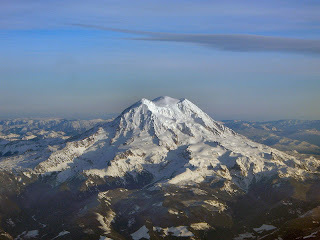 A couple days I have experienced the majestic beauty of Mount Rainier out in full glory. From experience, I know it's not everyday that you get the opportunity to see such majesticness; it always causes a person to slow down, stop and breathe in this sight. The other day I was thinking about Mt. 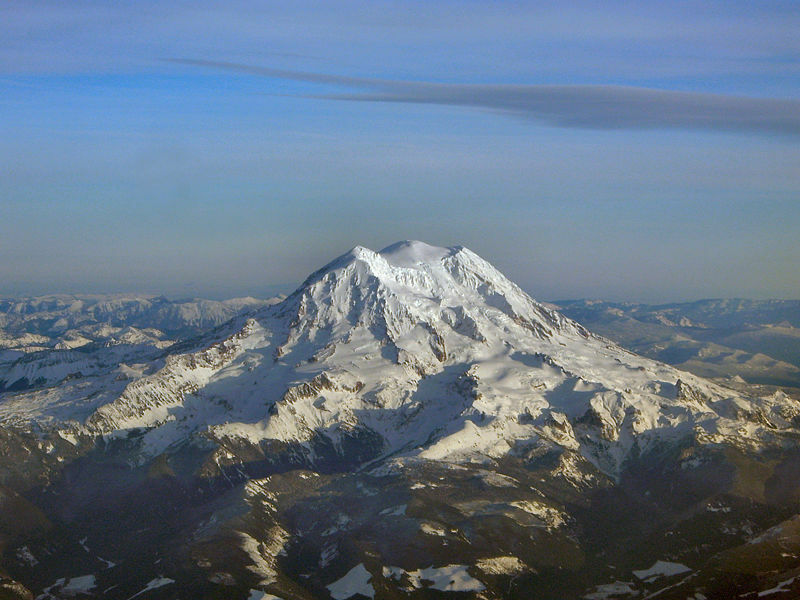 Rainier and how it reminds me of hope. Most of the time you do not see hope, just like you don't see Mt. Rainier when it is overcast. We all know, believe and wait for the mountain to appear. Then, when the clouds of life part from our yearning, longing, grieving or whatever state we are in, we find the splendor of hope. This hope causes my soul to swell. Hope is a fickle attribute in our lives because we never know when it will reveal itself. But we know that our hope will not be disappointed, because the love of Christ has been poured out in our hearts. The suscipe from Psalm 119 that we sing at profession is: "Receive me, O Lord, that I may live; do not disappoint me in my hope." Our hope is in the majesty of Christ's presence in our lives, and the promise of everlasting life and the coming of God's kingdom. Hope finds its way to reveal itself in majesty through the colors of autumn, the smile of a friend or the birds flying south. If none of these are present to you today, I recommend a strong cup of coffee and quilting project. This blog is maintained by a group of Sisters at Saint Benedict's Monastery in St. Joseph, Minnesota. We try to post weekly and often succeed at that. The opinions on this blog belong to individual writers and do not reflect any official position of the monastery. Please feel free to comment on any of the entries-- comments are moderated, but we'll publish any reasonable comment. To learn more about our Order, visit our Web site at http://www.sbm.osb.org/. Schedule a retreat at our Spirituality Center. Interested in becoming a Sister? Visit our Vocations Page.